We have shown that the angle sum of a star polygon or a pentagram is . 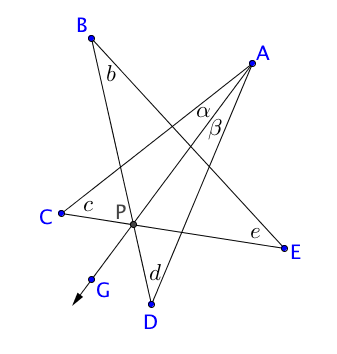 In this post, we discuss another proof of the star polygon angle sum theorem. Let be a star polygon with angle measures and . Recall from the Remote Exterior Angle Theorem that the measure of the exterior angle of a triangle is the sum of the measures of its two remote interior angles. We start the proof by drawing ray . We let as shown in the next figure. But this is the sum of the interior angles of the star polygon. 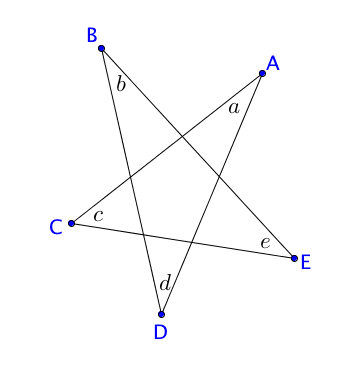 Therefore, the angle sum of a star polygon is equal to .